It’s always great to come across these two-in-one releases. They’re usually price quite nicely and this one was no different as I picked it up from CD Universe for around $13. I know Melissa has a few other re-releases with bonus tracks, but you have to shop frugal and pairing the album with The Beginning (a compilation featuring their debut Nuns Have No Fun EP and a few other rare tracks) seemed like the best deal. To most knowledgeable metal fans, Melissa, the debut album from Mercyful Fate, is already a known classic heavy metal release. Now I can say it myself that it is indeed a classic. I have held off on bands like Mercyful Fate, Slayer and Venom for so long. Yes, I know they are all groundbreaking bands that are revered in the world of metal, but such rampant talk about Satan and just evil in general has never interested me. Even though these bands have used the occult as a gimmick and to simply tell a story through song, it didn’t appeal to me for the longest time. To this day, I still have no interest in Slayer or Venom but I’m slowly becoming a fan of Mercyful Fate and the reason I gave the band a chance again (I had sampled some of their stuff years ago) is because of the video game Guitar Hero: Metallica. 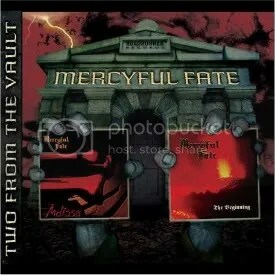 In that game, Mercyful Fate re-recorded “Evil” and it’s a killer tune! Man, it’s nothing like what I had in mind from these guys. It’s a great early NWOBHM metal song but it also relies heavily on blues and classic rock. I love it, but I love the original version even more because King Diamond doesn’t sing so darn high like he does all throughout the 2008 version! Melissa is definitely a heavy metal classic though, and I’m ashamed I hadn’t given it a chance sooner. As for The Beginning, it’s a great release as well, featuring all four songs from their first EP and the rest of the tracks are of television performances or rare demos. Another must-have for anyone who is just starting out on listening to Mercyful Fate, I think.